We strive to provide safe, quality childcare and educational services. Our highly trained teachers aim to build positive self-esteem with each child. Discovery Schoolhouse offers a nurturing environment designed to foster security and happiness. We love children and are dedicated to making our school a place of excellence and fun. Our door is always open for parents to discuss their needs, ask questions, and provide any suggestions. We encourage you take a tour of our facility and meet our friendly staff. We are confident that you will agree with us that this is the best environment for your child! We have developed our own curriculum using many different local and international curriculums. Our curriculum focuses on the development of the whole child, as an inquirer within and beyond the classroom. We strive to make our students independent in their learning skills, with strong personal values academically, socially and emotionally. We encourage our students to take responsibility for learning, to have strong personal values and international mindedness. We have developed our own curriculum using many different local and international curriculums. Our curriculum focuses on the development of the whole child, as an inquirer within and beyond the classroom. We strive to make out students independent in their learning skills, with strong personal values academically, socially, and emotionally. We encourage our students to take responsibility for learning, to have strong personal values and international mindedness. A BEKA is an age appropriate, workbook based curriculum for children beginning at age two. It is used in many of our class rooms in addition to other educational programs and tools. Chinese, Spanish, art, music and tumbling are also a part of our program. Focus on providing a fun and educational environment to enhance a child’s natural intellectual curiosity. This includes the use of A BEKA curriculum, physical activity and social and emotional developmental exercises. Degreed and experienced teachers are all certified in First Aid and CPR. Classrooms are designed around the needs of the children both from an educational and nurturing perspective. Three age-appropriate playgrounds, equipped with the latest equipment and shade covers, are provided for the safety and enjoyment of your child in Cinco Ranch. While your child is busy learning, playing and growing, you can take comfort in our focus on providing a safe environment. Highlights range from controlled access to the facilities, video cameras, CPR and first aid certified staff, FBI criminal background checks on all staff, monthly fire drills to finger guards on all classroom doors. Our state of the art educational learning center is equipped with an Internet-based digital Video Monitoring system. This system allows parents to securely view live video of their children at school from any location via the Internet. Discovery Schoolhouse is proud to announce that we have been awarded the “Texas Rising Star Accreditation”. 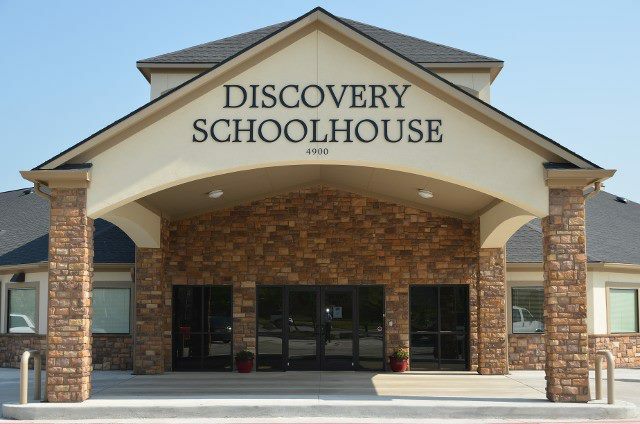 Discovery Schoolhouse was accredited at the highest level 4-Stars. The TRS assessors acknowledge that it was extraordinary for an independently owned child care center to be rated at a 4-star level on initial induction into the program. TRS certified schools contribute progressively more to the development of the children they serve on a daily basis, and are in a better position to contribute to the early development of children. Discovery Schoolhouse provides educational preschool child care. Our school offers a range of educational programs for children from the age of 6 weeks to 5 years old and before and after school care for children 5 – 12 years old.